This book was an adventure for me and has a storied history. In the Summer of 1991, I attended the ALA (American Library Association) conference in Atlanta. One of the authors in attendance happened to be Carolyn G. Hart, who had recently released The Christie Caper, an homage to Agatha Christie. Of course, for me, this was a book I had to get. Getting it signed by the author would be an added bonus! Well, the Sisters in Crime booth, where the author signing was to be, didn’t have copies of the book! The author was very gracious though. She signed copies of a book cover handout and mentioned that she had signed copies of The Christie Caper at a bookstore north of downtown Atlanta. Well–continuing on the hunt–my Dad and I took the MARTA out to the shopping district and to the bookstore, where–yeah!–I got my very own signed copy. Now, you might ask, did I enjoy the book for all the trouble it took me to get it? No, because it sat on a bookshelf unread for years. I still don’t know why I never read it before. 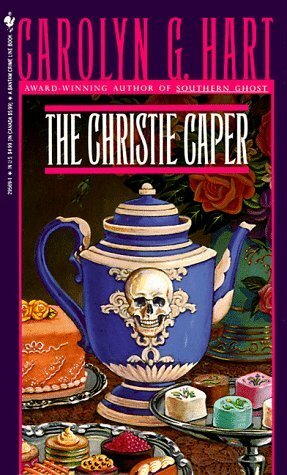 However, when I started up a mystery book discussion group at my library in September 2004, I chose The Christie Caper as the inaugural selection. Our first little group of five shared our thoughts on the book. The Christe Caper is the seventh in the Death on Demand series, featuring Annie and Max Darling. Annie, proprietor of a mystery book store, is celebrating the 100th anniversary of Agatha Christie. When the most hated book critic Neil Bledsoe shows up, the celebration sours, and though two attempts are made on Bledsoe’s life, it is a would-be author who ends up dead. Our little book group, in general, loved this book. Most of us were fans of Christie. And The Christie Caper offers snippets of trivia about the Queen of Crime, including a description of five paintings that represent Christie titles. A couple of those were not easy to solve. The murder mystery in the book was top notch, too. As a result, I have read other books by Carolyn G. Hart. I do find that I like the Death on Demand books best. Though I have yet to read them all. So yes, after all that time and effort, The Christie Caper was worth the read. How did the book group feel about reading a book that was mid-series? So many series books require knowledge from the previous books, yet, often the first books have yet to “hit their stride.” I often wonder how to handle this when selecting books for a book club. Just wondering…. Most series books should be written with the idea that not everyone has read the previous books. An author never knows just when they may pick up new readers. Most of the time references to past events are a bonus to those readers who have read every book and a “hook” to encourage newer readers to seek out the previous stories. Book clubs can benefit by reading a mix of either the first book in the series or any book after. A lot of times it may depend on the availability of the selected title. When looking at a debut novel consider how it compares to other first books you’ve read and forecast how you think the series will grow. If the book is midstream in the series consider whether the characters continue to develop and evolve or are they more in a rut. Series characters tend to change very slowly over the course of their series.